WASHINGTON (AP) — The CIA honored its old boss, the only spy chief to become president, with visits to George H.W. 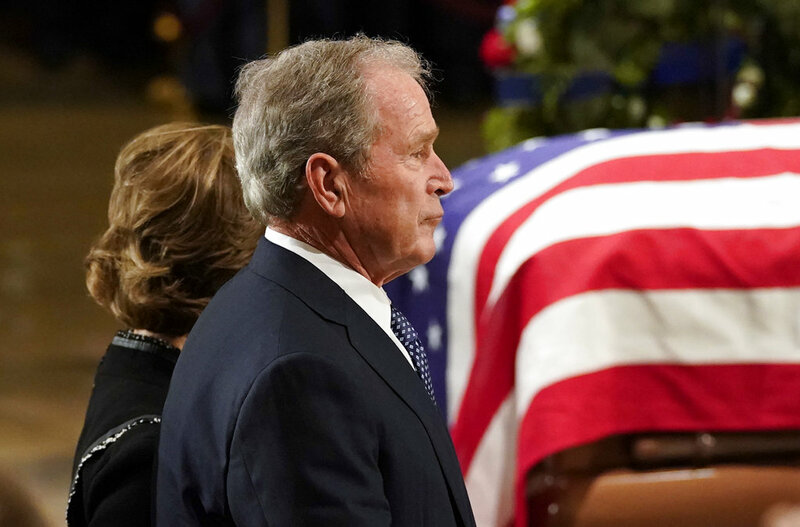 Bush’s flag-covered casket on Tuesday, joining members of the public who had lined up before dawn to pay respects to the 41st president in the U.S. Capitol rotunda. Besides the thousands of people streaming by, Sully, the late president’s service dog, was brought by, too. In the midst of the mourning, the Trumps invited the Bush family to share some holiday cheer with a tour of the Christmas decorations at the White House. 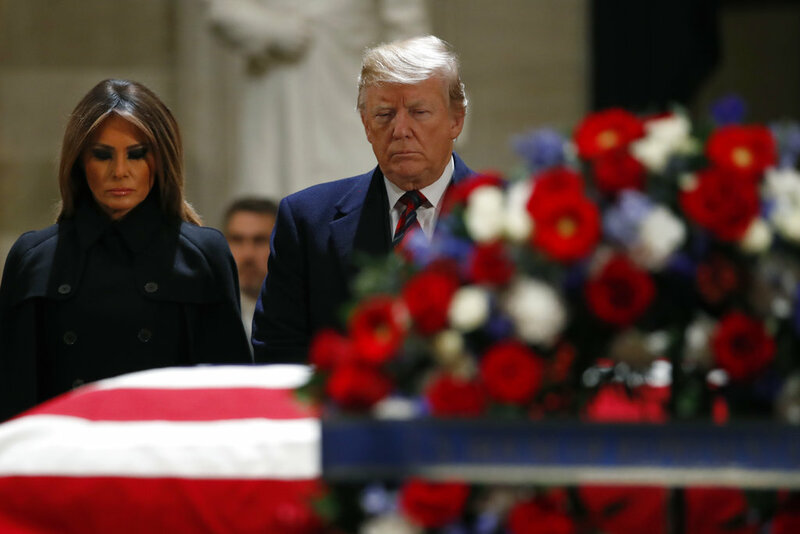 President Donald Trump and first lady Melania Trump visited Bush’s casket in the hushed Capitol on Monday evening, standing with their eyes closed before the president gave a salute. Although the president will attend Bush’s national funeral service Wednesday, he is not among the eulogists announced by the Bush family, a list that includes the late president’s son, former President George W. Bush. “The elegance & precision of the last two days have been remarkable!” Trump tweeted of the funeral ceremonies, which opened in Texas and came to Washington on Monday, with Bush lying in state at the Capitol until the Washington National Cathedral service. On Tuesday, CIA Director Gina Haspel and former directors John Brennan and George Tenet visited Bush’s casket, as did Colin Powell, chairman of the Joint Chiefs of Staff when Bush assembled the coalition that rescued Kuwait from Iraq’s invasion in the Gulf War. Sent off from Texas with a 21-gun salute, Bush’s casket was carried to Joint Base Andrews outside the capital city aboard an aircraft that often serves as Air Force One and designated “Special Air Mission 41” in honor of Bush’s place on the chronological list of presidents. Cannon fire roared again outside the Capitol as the sun sank and the younger President Bush stood with his hand over his heart, watching the casket’s procession up the steps. Bush was remembered just feet away from what he called “Democracy’s front porch,” the west-facing steps of the Capitol where he was sworn in as president. Although Bush’s funeral services are suffused with the flourishes accorded presidents, by his choice they will not include a formal funeral procession through downtown Washington. On Sunday, students, staff and visitors had flocked to Bush’s presidential library on the campus of Texas A&M University, with thousands of mourners paying their respects at a weekend candlelight vigil at a nearby pond and others contributing to growing flower memorials at Bush statues at both the library and a park in downtown Houston. “I think he was one of the kindest, most generous men,” said Marge Frazier, who visited the downtown statue Sunday while showing friends from California around. After services in Washington, Bush will be returned to Houston to lie in repose at St. Martin’s Episcopal Church before burial Thursday at his family plot on the library grounds. His final resting place will be alongside Barbara Bush, his wife of 73 years who died in April, and Robin Bush, the daughter they lost to leukemia in 1953 at age 3. Bush’s passing puts him in the Washington spotlight after more than two decades living the relatively low-key life of a former president. His death also reduces membership in the ex-presidents’ club to four: Jimmy Carter, Bill Clinton, George W. Bush and Barack Obama.